There has been talk of a dark theme for SSMS for years. Does it exist, will it exist? Well, the answers really are yes, and no. And by that I don’t mean yes and no as in maybe. I mean litterally, does it exist yes and will it exist no. First of all, why does anyone care? Well, for some of us staring at a white screen all day long is just downright annoying if not headache inducing. A darker background is just easier to work with. Although it is harder to see when presenting so I don’t recommend it there, but for day to day work, it’s quite nice. The other day a co-worker of mine (not even a DBA or database developer as it happens) pointed me to this article on SQLShack about setting up the dark theme for SSMS. Just to be somewhat complete in this post I’m going to review basically how it’s done but follow the link for details. 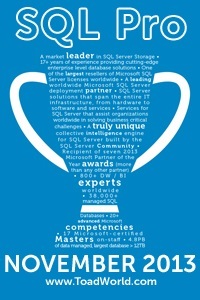 Yes, this means that this only applies to the latest two versions of SSMS. Once in the file find the Remove Dark Theme category and comment it out (using // at the beginning of each line). We have a Dark theme! But, there are a few problems. First, let me point out that as far as I know, this isn’t a supported thing. If you have the dark theme enabled you may have issues with MS support. Also, you’ll notice that it’s not applied everywhere. Some areas are still white. In fact, it’s pretty hit and miss. There is a reason for this. From what Ken Van Hyning (t) has said there are many pieces of code that are not theme aware and the cost to fix it is just too high. 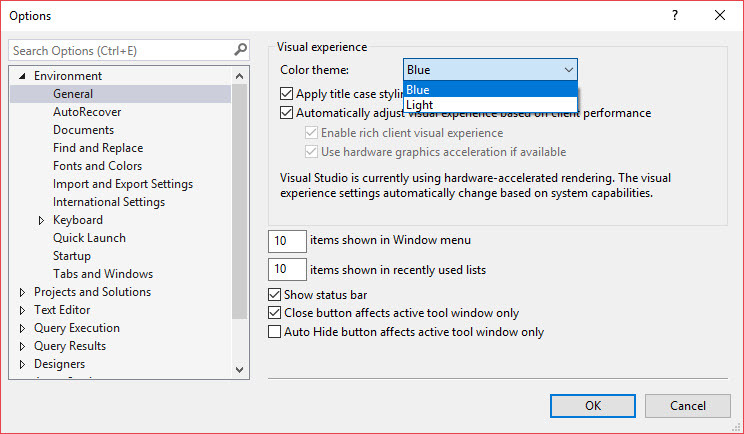 Which means that in SSMS we aren’t ever likely to have a fully consistent dark theme. (What I meant by yes and no.) That said the new SQL Operations Studio is fully theme aware. So if you really want the dark theme you can use that. It can’t do everything that SSMS can (it’s also still in preview) but it’s coming along. But that does bring up another problem. I really don’t like the dark theme. The icon colors are pretty cool, and I like how the disabled stuff is clearly obvious but I find the black on dark gray words in the menu hard to read and overall it’s just a bit too dark for, me. So what’s a guy to do? 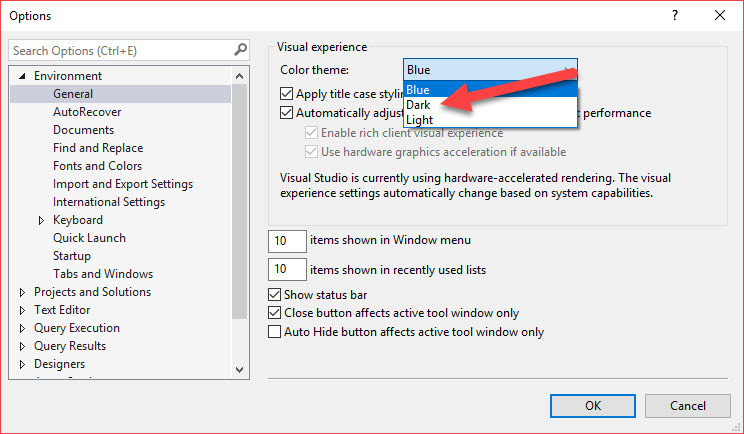 Well a while back I read a post by Aaron Bertrand (b/t) about how he had the colors on SSMS set up. In it, he also mentioned Doug Holland’s version which is pretty much what I’m currently using. The menus, output, windows etc are unchanged but I find the query window much easier to read. And since that’s where I spend most of my time it works for me. Unfortunately, his file doesn’t appear to be available anymore so I’ve exported mine and added it here. 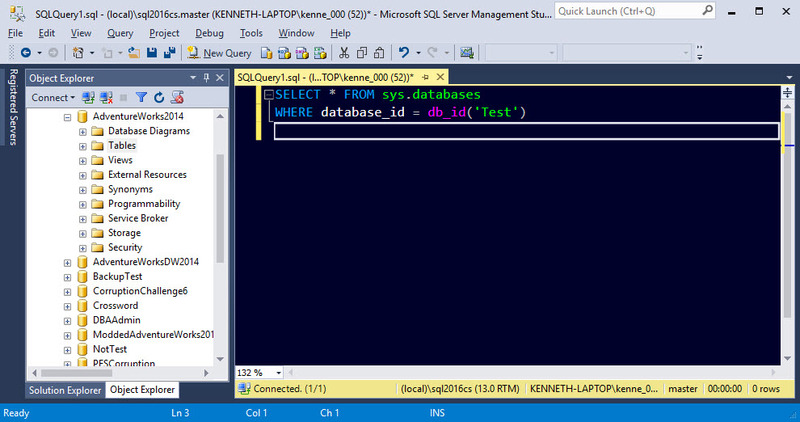 If you want to see more about how I have my SSMS set up go here. 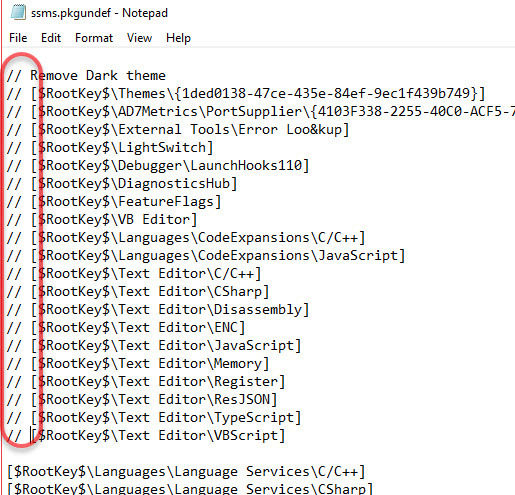 If you find dark windows theme then the white backgroud in the object explorer will change to dark. I have windows 7 with dark theme (I can’t remember the name at the moment) and enabled the dark theme in SSMS this way, and it is so nice to work with. Interesting. I wasn’t aware that was a possibility. Thanks! Avoid the Dark Side (theme). It is buggy, Microsoft has never been able to handle colors, they have been trying for years and have never really created anything that works correctly in any product. Outlook couldn’t handle even changing colors without issues for years. Its easy to see that who ever they had working on this was not a fan of the dark theme and never really used it themselves, and the testing must have been minimal if there was any. The colors they chose make the theme difficult to work with at best. (i.e. dark green when lime would be much more readable). Even just changing font size in the grid is a nightmare. Attempting to use themes will only lead to disappointment. I agree completely that it’s buggy. From what I understand they are still dealing with some technical debt in SSMS when it comes to being able to do themes etc correctly. Personally I prefer a black background so I borrowed one from somewhere else.